Rogers is the last city on westbound Interstate 94 in Hennepin County but the first city more residents and businesses are calling home. The northwest metro suburb is the fastest growing city in Minnesota — and it isn’t slowing down, with plans for more large-scale housing and industrial developments over the next few years. 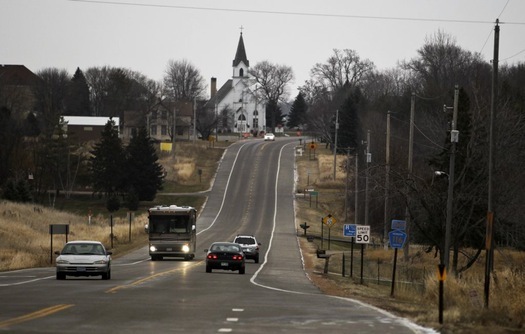 Even without Hassan’s population, Rogers’ city leaders said it’s had a more than 10 percent increase in residents, and that still puts it in the top fastest growing cities in the state. The growth spurt hasn’t come without challenges. The city is grappling with issues other suburbs long have had to deal with — figuring out how to pay for rebuilding and adding roads, redeveloping its downtown and balancing its small-town character with suburban-style development. Christi Tullbane was driving past Rogers on I-94 eight years ago to her house in Maple Grove when she spotted an intriguing housing development sign. She and her husband, drawn to the city’s small-town feel, moved to Rogers for a new house on a larger half-acre lot for their three young daughters. “There’s just that sense of community,” she said. Larger home lots, small schools and a gateway location to the metro area are drawing new residents to Rogers, while the wide open spaces are bringing a huge influx in industrial development — with 1.9 million square feet being built since 2011. “It’s really booming here,” said DJ Hartley, who runs the I-94 West Chamber of Commerce. Population projections from the Metropolitan Council say that Rogers will pass 14,000 residents in the next four years and hit 18,000 by 2030. But in a community still known for farmland and open spaces, bringing in higher density housing to meet the Metropolitan Council’s requirement spurred some resident backlash this year over smaller lot sizes. And when the city proposed imposing franchise fees on public utilities — an increasingly popular funding method cities are using to pay for projects — residents rallied against the idea. Nevertheless, city leaders say, home lots are still larger than most other metro cities’, and taxes have remained relatively flat. “We’re still a rural community,” said Ihli, reeling off a list of the last names of longtime families and owners of ­four-generation-owned farms. This year, new housing developments have slowed because of the reduced availability of lots, with about 50 new homes being built. But there are future plans for another 500,000 square feet of industrial development and a 300-acre housing development, City Administrator Steve Stahmer said. Just two decades ago, Rogers had no stoplights and only one school. Now its high school is building a third wing and home lots are sprouting out of former farm fields. New major businesses, like a massive FedEx Ground distribution center, are drawing hundreds of jobs. The city’s population jumped from 2,649 people in 1990 to more than 11,000 residents in 2010, according to census data. Now the city is nearing 13,000 residents, half of whom commute 30 or more minutes to work, usually to Minneapolis and other west metro suburbs. Employers in Rogers provide nearly 10,000 jobs, drawing employees from across the metro to companies like Graco Inc. and Cabela’s. “It’s not a bedroom community,” Stahmer said. Lifelong resident Dave Christian, who was born on a farm in Rogers, has watched the town’s dramatic shift. Aside from the lack of affordable housing, which he believes is needed, he said many long-term residents like himself are pleased with Rogers’ evolution.